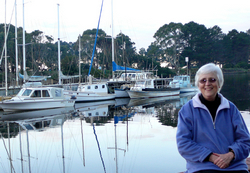 I am Mary Bosveld aka "The SuperGranny"
I come from Australia ..."The Land Down Under"
I actually live even further “Down Under”... on the Island State of Tasmania. 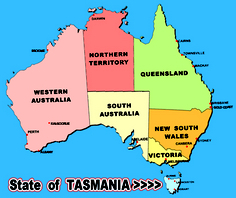 Tasmania is the home of TAZ…Warner Bros’ famous cartoon character. And YES, it’s perfectly safe to go outside after dark. I have been married for over 40 years. We have 19 grandchildren worldwide, far and near. 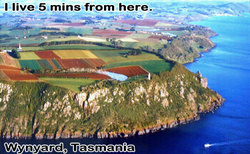 My husband & I live in the little rural country town of Wynyard in Tasmania. Our house is set on a hill, with a delightful view of little houses & cattle in the valley below. We have real country living...but we are only 4-5 minutes from the Airport & the Post Office. In Summer, the area also attract many tourists to our spectacular white beaches. 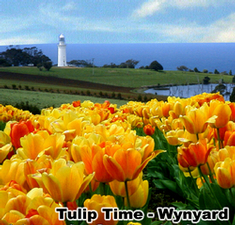 Wynyard is also known as the Tulip Town. I was a latecomer to computing…but I quickly grew to love graphic arts. I have taught myself a lot about graphic design. Greeting Cards, etc for a select clientele. I have worn out 14 printers and couldn’t count the ink cartridges I have refilled. I have been networking off line and online for years. I have been in many opportunities with varied success. You could say that many of these opportunities have been a waste of time, but in reality, none of the opportunities have been wasted…The things I have learnt and the experiences I have gained have been invaluable. One of the most difficult things I have always found, is not having help or support of a sponsor. Probably 80% of the time, my sponsors have moved onto greener pastures. I have been left an “Orphan” again & again. BUT, it hasn’t been all bad…. I have quickly learned to stand on my own two feet. I am very persistent and I have forged ahead, developing my own resources and building my business. On one such occasion where I was ‘orphaned’ I had just paid quite a considerable sum of money to join a video business opportunity. The company had said that you didn’t need any video knowledge to promote their business. But I soon realised that for it to really work, I would definitely need to make videos and front up to the camera myself. Where to start? I was completely ignorant, and I had NO ONE to help me. I bought a video camera & literally struggled my way through 2 months until some little glimmers of light started shining through. The editing software also presented a big challenge to me. I was nearly pulling my hair out, trying to understand it. But I slowly started to understand what it was I was trying to achieve and how to do it. I am still far from being a professional….but I have grown to love the fun & challenge of producing a simple video * Where there is a will...there is a way! Where did the Supergranny nickname come from. I may have 19 grandchildren, but this has nothing to so with my nickname. The name started with some of my team Downline calling me The Supergranny…and that was soon adopted by team members in my Upline too. At first I felt it was done to take the Mickey out of me…but I soon I realised that it was kindly intentioned..
What was I going to call myself? Once I started branding myself online, I found out just HOW valuable my video experience and knowledge was to furthering my presence online. So I guess there’s a lot of merit in learning in the School of Hard Knocks. I now have a thriving channel on YouTube with good traffic every day. http://www.youtube.com/thesupergranny Below are a few of The Supergranny's video links. The Supergranny asks "What is Mandura?" The WORLD'S OLDEST FORD Motor Car (1903) ... fully restored. Junk...Not worth a dime...WHO SAYS? I continually strive to be a good, caring team leader who cares for the wellbeing and success of my team and Mandura. Above all....I thank God for all His goodness, mercy and care of me throughout my life. The fear of the Lord is the beginning of wisdom. Happy is the person who trusts in Him.